Be the first to review this 2019 Ford Fusion. The Ford Fusion has anchored the automaker’s sedan lineup for a decade—it elbowed aside the Taurus to do so. But as sedans have made way for crossover SUVs, so will the Fusion. 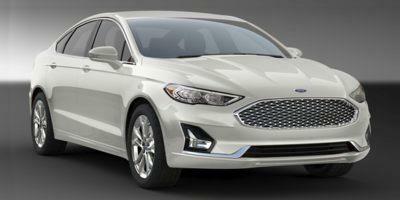 Ford will soon stop making the Fusion as it trims its passenger-car lineup. Both Hybrid sedans blend a 4-cylinder 2.0-liter Atkinson-cycle engine with twin electric motors, having a combined output of 188 horsepower. Tucked into the hybrid sedans’ trunks is a lithium-ion battery pack—1.4 kwh in the Hybrid and 9.0 kwh in the Energi. A continuously variable transmission (CVT) shuttles power to the front wheels. Safety scores are great. The Insurance Institute for Highway Safety gives the Fusion its top Good scores in every crash test. The standard automatic emergency braking system earned the top "Superior" rating. Still, the headlights are rated "Poor." The Fusion S is the cheapest and least powerful Fusion, with a 2.5-liter inline-4 rated at 175 horsepower. Its power peaks high - at about 4,500 rpm - meaning it needs to be revved for good acceleration. The base engine works well enough with the 6-speed automatic transmission, which is shifted via a knob in the center console. It’s an adequate setup overall.